I'm not on a diet. That said, I'm watching what I eat, and try to keep between-meal snacking, overly fatty food, and caloric pitfalls to a "healthy" minimum. I've maintained my weight well over the last few months, and I'm approaching 200lbs for the first time since high school. Enter real life. Between a busy weekend, my mom moving, my car breaking down, having a two year old and a host of other things, I found myself going out to eat an inordinate number of times. When I did eat at home, it was a quick meal, and not always well thought out. So even though I'm not on a diet, I've done a hell of a job this week in making sure I eat pretty poorly. What's a guy to do? Eat soup. I've never been one for purifying, detoxification, or flushing out my body - it'll do that itself when you give it the right foods. And since I'm predicting the rest of the week could be as busy as the first half, I figure I might as well have something easy, tasty, and healthy to grab. For me, it's this very simple to make, very cheap, and very tasty veggie soup. Place tomatoes and juice into large pot on medium high heat. 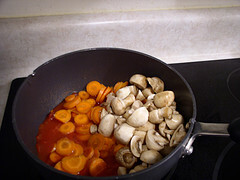 Add vegetables, then add enough water to just cover them. Cook on medium high for 45-50 minutes, until all vegetables are cooked through. Add salt, pepper and any other spices you like, to taste. Makes 6-8 servings. Serve with crusty bread. Thoughts and Observations: Just like with the Shepard's Pie below, feel free to add any veggies you have handy to this soup - peas, green beans, broccoli, cauliflower, beans etc. 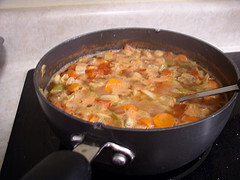 Make sure you add enough salt - there's no reason the soup has to be bland just because it's all vegetables. Enjoy! This page contains a single entry by Michael Doss published on March 18, 2009 11:53 PM. Vegetarian Shepherd's Pie was the previous entry in this blog. Question of the day is the next entry in this blog.